The U.S. government has certified Alta Devices as having created the highest efficiency solar panel in existence yet. 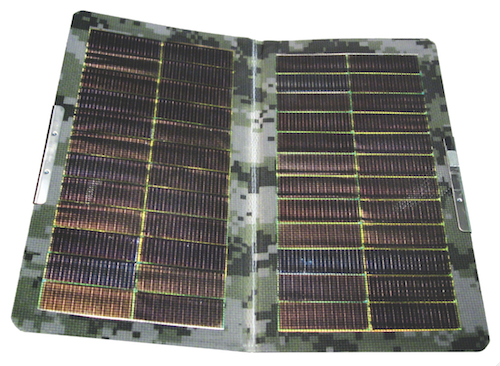 Friday the California startup announced its first product: A flexible, extremely lightweight and fully portable solar charging mat designed for the U.S. military, which also achieves the highest efficiency of any such solar portable charging device used by the armed forces. Alta Devices’ new solar charging mats come in two sizes with differing energy outputs — 10-watt and 20-watt, both which offer world record energy efficiency of 24.1 percent, an increase even from when Alta was first certified by the U.S. government in February 2012. The major technological advance behind Alta’s record-setting ultra-flexible solar panels is a material called gallium arsenide, a byproduct of aluminum smelting combined with arsenic, which turns out to be perfect for solar panels because it can withstand high temperatures and be sliced extremely thin — one micron thick — or about the thickness of a human hair in Alta’s case. Alta has filed 77 patents on its advances. Alta’s new invention clearly fits in well with the U.S. military’s continued efforts to power more operations with clean energy, but the consumer electronic industry is extremely interested in what Alta has to offer for consumer mobile devices like tablets and smartphones, too. AltaDevices’ Web Site describes the exciting directions the company is exploring. There is an interesting Idaho connection. The CEO of AltaDevices, Chris Norris, was born and raised in Howe, Idaho. We are a bunch of volunteers and opening a brand new scheme in our community. Your site offered us with valuable info to work on. You have done a formidable process and our whole neighborhood shall be grateful to you.